Testing can be stressful for your students and they need all the advice you, as a teacher, can give them. 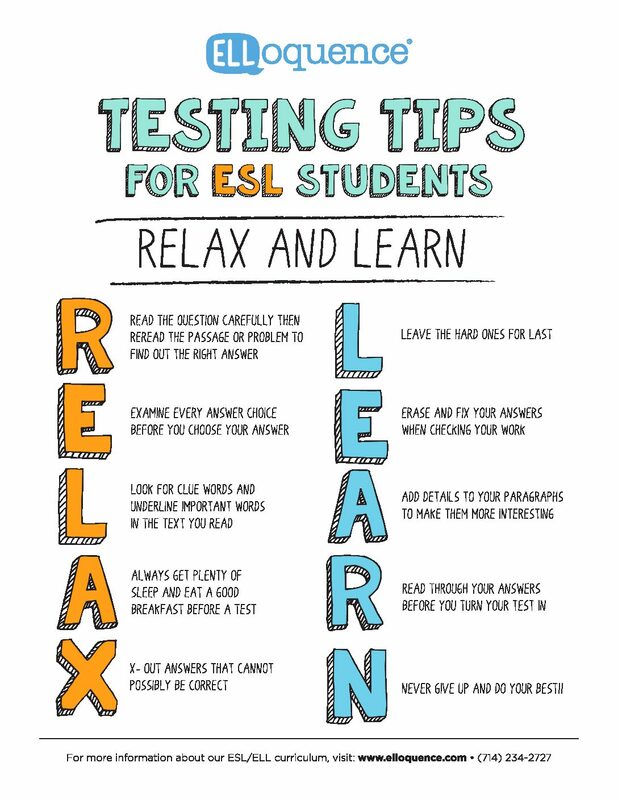 Here at Thesys, we use two acronyms to keep in mind helpful tips ESL students need before a test: relax and learn. R – Read the question carefully, then re-read the passage or problem to find the right answer. It’s important students take their time on both the questions and the passage in front of them. It’s always a good idea to return to the passage after reading a question. E – Examine every answer choice before choosing an answer. Advise your students not to fall for trick answers! Reading all of the answers gives a better chance they aren’t fooled by one that might be similar to the correct one. L – Look for clue words and underline important words in the text you read. This will make it easier when re-reading the passage for answers. A – Always get plenty of sleep and eat a good breakfast before a test. Tired or hungry students will have a hard time concentrating. They need all the energy they can get! X – “X”- out answers that cannot possibly be correct. Process of elimination: for every answer your student knows is incorrect they have a higher chance of choosing the correct one. L – Leave the hard questions for last. It’s better for your student to answer the questions he or she can, rather than waste test time on a question they may not be able to find an answer for. E – Erase and fix your answers when checking your work. Encourage your students to always go over their answers if they have time before the testing period ends. A – Add details to your paragraphs to make them more interesting. What better way to build and practice your students’ vocabularies? R – Read through your answers before you turn your test in. Similar to E, if time permits your students may catch tiny mistakes that could have cost them a point. N – Never give up and do your best! It’s easy to get bogged down by a hard question and have trouble moving forward, but if your students persevere through and try their best it will at least push them in the right direction for future tests. Other advice from ESL teachers for testing includes encouraging students to practice speaking and writing in English as much as they can. Golder College Prep teacher, Mariel Race, says creative writing is a perfect outlet for such practice. She also suggests fun activities to prepare for tests such as a competition of which student can say the longest, most detailed sentence. While these tips will hopefully assist ESL/ELL students, it’s important to note that testing can be a busy and stressful time for teachers too. Teachers can help their students “learn and relax” by being relaxed themselves before testing. Hopefully that will then rub off on the students! Download a poster of “Relax and Learn” for your classroom for free!